ECOFACT is the only company in Ireland to offer River Habitat Survey (RHS). River Habitat Survey is a methodology for recording habitat features for wildlife that was designed by the UK Environment Agency, for use in Britain and Ireland. River Habitat Survey is used as a standard methodology for assessing hydromorphology as part of the EU Water Framework and as a tool for monitoring river habitats and for assessing potential impacts of developments. ECOFACT staff are fully qualified to undertake River Habitat Survey (RHS) following the ‘River Habitat Survey in Britain and Ireland Field Survey Guidance Manual: 2003 Version’ published by the Environment Agency (EA, 2003). All RHS site data we collect is entered into the Rapid 2.1 access database developed by the Centre for Ecology and Hydrology (CEH). These scores are generated as tables for completed RHS sites, and are explained below. The Habitat Quality Assessment (HQA) is a broad indication of overall habitat diversity provided by natural features in the channel and river corridor. Points are scored for the presence of features such as point, side and mid-channel bars, eroding cliffs, large woody debris, waterfalls, backwaters and floodplain wetlands. Additional points are attributed to reflect the variety of channel substrata, flow-types, in-channel vegetation, and also the distribution of bank-side trees and the extent of near-natural land-use adjacent to the river. The HQA score for a site is the total of all the component scores in each of the habitat / channel diversity categories; with no single hydromorphological feature dominating. The higher the score, the more highly rated / diverse the site; attribute points and cumulative scores are developed within the RAPID 2.1 database. Total HQA scores for UK (and Irish) rivers tend to vary from 10 – 80. 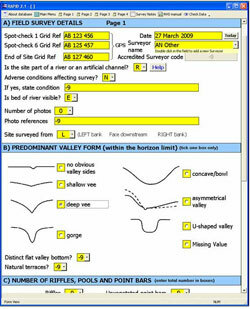 Habitat Modification Score (HMS) is an indication of artificial modification to river channel morphology. 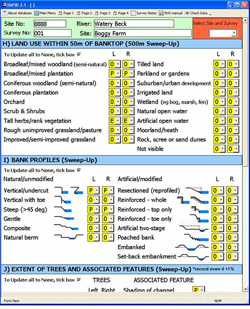 Data from RHS and the supplementary bank vegetation notes were used to provide a broad assessment of the naturalness of the river banks with regard to the degree and persistence of artificial modifications which are evaluated as the Habitat Modification Score (HMS). To calculate the HMS for a site, points are allocated for the presence and extent of artificial features such as culverts and weirs and also modifications caused by the re-profiling and reinforcement of banks. Greater and more severe modifications result in a higher score. The cumulative points total provides the Habitat Modification Score (HMS). A Habitat Modification Class (HMC) protocol has been developed which allocates the condition of the channel in a site to one of five modification classes, based on the total HMS score (1 = pristine to 5 = severely modified). ECOFACT is the only company in Ireland to offer River Habitat Survey. If you require any further information on River Habitat Survey, or any other aquatic ecological service, please do not hesitate to contact us.